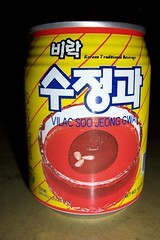 Sujeonggwa is a Korean traditional fruit punch. Dark reddish brown in color, it is made from dried persimmons, cinnamon, ginger and is often garnished with pine nuts. The punch is made by brewing first the cinnamon and ginger at a slow boil. The solids are then removed for clarification and the remaining liquid is boiled again after adding either honey or brown sugar. The dried persimmons are cut into portions and are added to soak and soften after the brew has completely cooled. This is usually done several hours before serving, as extensive soaking of the fruit may thicken the clear liquid to a murky appearance. The earliest mention of sujeonggwa dates back to 1849 in the book Dongguksesigi (동국세시기, 東國歲時記), a book of seasonal customs written by scholar Hong Seok Mo (홍석모). The sujeonggwa recipe mentioned in the book is a dried persimmon brew with added ginger and pine nuts. Sujeonggwa is known to have been prepared in the Goryeo era by palace women on New Year’s Day. Then they were boiling ginger and adding persimmons to the brew. Its former name was baekjeho (백제호), literally meaning "white milky beverage", and was named after the white appearance of sugar-coated persimmons. ^ a b c "수정과 水正果 Sujeonggwa Cinnamon Punch". Encyclopedia of Korean Seasonal Customs. Retrieved 24 April 2013. ^ "Sujeonggwa (Ginger Beverage)". Visit Seoul. Retrieved 2013-04-24. 40x40px Wikimedia Commons has media related to Sujeonggwa.